This the time of year when I start getting antsy to see green vegetation, flowers, and insects again. Since our prairies are still brown and dormant, I have to live through photographs from previous field seasons. Here is a photo from August 2012 I found yesterday while looking through old images. Bush katydid (Scudderia?) on a rosinweed (Silphium integrifolium) flower – The Nature Conservancy’s Platte River Prairies, Nebraska. The beautiful green creature in this image is a katydid, not a grasshopper. The easiest way to tell is by looking at the length of the antennae, which are very long on katydids but very short on grasshoppers. There are numerous species of both katydids and grasshoppers in our prairies, and by late summer, most have gone through their final molt and have become fully adult – with the wings to prove it. You may not be aware that katydids have special hearing devices on their legs. In the photo above, you can see dark pits in the “forearms” of the insect, right below their “elbows”. Inside those pits are tympana that vibrate just as our own eardrums do. For an excellent description of this, and an explanation of how it’s an advantage to the katydid to have its ears on its legs, read this post on the Living with Insects Blog. 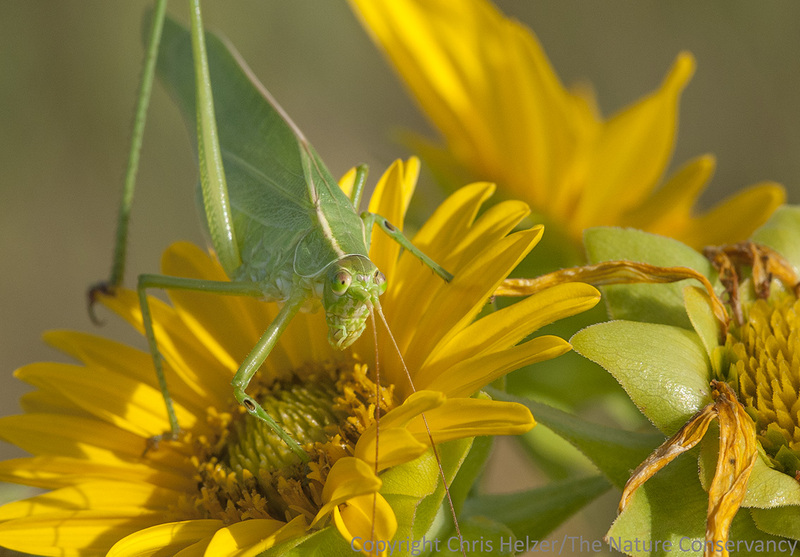 This entry was posted in Prairie Insects, Prairie Natural History, Prairie Photography and tagged bush katydid, image, katydid, photo, prairie, rosinweed, silphium by Chris Helzer. Bookmark the permalink. Beautiful! The singing Orthoptera are my second favorite insect group!